It was with some trepidation that I began reviewing the UD3P, as initially, with the state the box arrived in, I was surprised that the board would even boot! Luckily, it did and the first set of benchmarks set the stage for what I assumed to be an identical run of scores to that of its much more expensive stablemate, the EP45 Extreme. However, once we were past the memory benchmarks, I was constantly impressed by the way this budget board performed. Getting the upper hand of motherboards costing twice as much is no easy feat, but the little Gigabyte board managed it without so much as breaking a sweat. Although the overclocking results were good, I was a little disappointed as I really wanted this board to perform above the other boards based on the same chipset. While it didn't disgrace itself, I am beginning to feel that the new range of boards are being held back by the older 65nm chips we use for our tests and believe the new range would be much more suited to the high FSB Wolfdale clockers. 500FSB is about the max anyone could expect of a Quadcore CPU based on the 65nm architecture, but there are dual core CPU's reaching 600MHz these days with just a few minor voltage adjustments. So while the UD3P scored well in the overclocking department, I would have no doubts in believing it can be pushed quite a bit further given a decent dual core CPU. The 3D benchmarks are where the GA-EP45 UD3P really stood out from the crowd. Consistently scoring high, at times outstripping boards costing double (including Gigabytes own EXTREME P45 board), the UD3P demands some serious consideration from any gamer wanting a last throw of the dice before i7 hits the shelves. 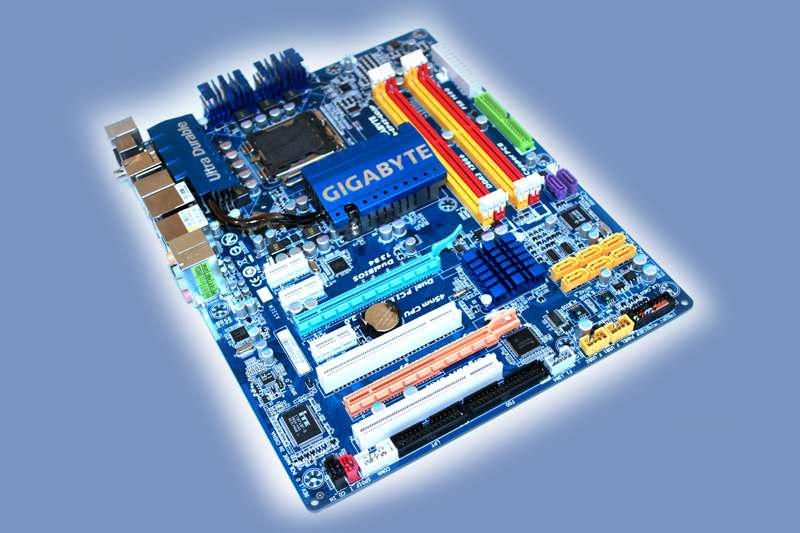 Thanks to Gigabyte for supplying the GA-EP45 UD3P for todays review. Discuss in our forums. It's a tricky judgement to make on this mobo, one of the many they have. They seem to have done a 'good' job of making a ddr2 mobo, from a ddr3 chipset, and it sorta holds it's own with the competition. Doesn't particularly beat anything out-of-the-water, and neither does it drop way-way back on anything. U see it drop on something and in the next stat it's up again. Average it out and it does 'good'. I struggle to understand why they bother bolting it down from ddr3, and not just stick with the ddr3 mobos. It could be argued they have both types already, in both 3 and 4 series, so I'm stumped further. It does a great job in the 3d department, so ur gaming isn't going to suffer in anyway. If ur a Gigabyte fan, it won't exactly let u down and u can drag that ddr2 with u. Not exactly an eyebrows-raiser, but ok it does 'good'. £115 - yeah ok, it's amongst the competition there too. Jeez, felt I had to report back. Installed the EP35 DS4 and frankly it's a great mobo. I have no idea of the benchies or anything, but I've installed it in a mATX style case that takes ATX mobos, with a wifi, 3 drives, and hopefully 4 OSes. It's gonna be my util pc, easy to move about. Just about got a 8800GT in the case, Q9400, 4 gig, blah blah. Put an Intel Extreme cooler on the cpu, and simply changed 2 things in the bios. Memory to 2x 333 base (from 2.4 auto), and cranked up the fsb to make the cpu 3g. Piece of cake, idles at under 30 - which I was amazed at. One special bonus was the ALC889A, dts and the drivers seem to work in Vista 64bit !